When I first received a ball of Homespun in Mimosa I wasn’t sure I liked it but by the time I started rolling it into a ball I saw the color change and loved it immediately. This scarf exhibits its color change perfectly. Aside from that, its a wonderful addition to a spring wardrobe, or even early fall. Where I live I wouldn’t recommend it for summer, but I’m sure there are people in cooler areas that would find it a great choice for those summer months. 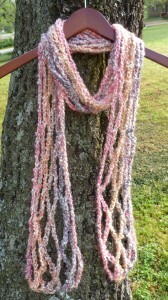 Either way, the netting pattern to the scarf gives it a delicate look, while the bulky weight of the yarn is light. Any questions? Feel free to ask in the comment section below and I’ll be sure and get back with you! This entry was posted on Friday, April 26th, 2013 at 7:56 AM by Amy	and is filed under Free Crochet Patterns. You can follow any responses to this entry through the RSS 2.0 feed. You can skip to the end and leave a response. Pinging is currently not allowed. This is going to be the first project I will be making after my shoulder heals from surgery…… Lov it…….. I love this! Will be great here in Australia where we are in Autumn heading for Winter. I don’t have Homespun in Mimosa but a lovely pea shoot green colour so I think that would look lovely too in this pattern. I also have a lot of Homespun Thick +Quilt in a mixed berry colourway – do you think this same pattern would work with the super bulky version also? Many thanks, Suzanne. Hi Suzanne! I’m glad you like my pattern. Yes, I think using a bulkier yarn would work just as well. Just keep in mind the finished product will be more bulky than the one in the pattern. I love this idea, as i have been working on an i-cord version that just wraps around your neck as many times as you want depending on the length you make it, now this seems to be a quick and easy pattern, as i’m only just learning the language of crochet, i’m looking forward to making this.. but i will be doing it in 8 ply wool ,which i think may give it a bit more bulk, which is your worsted weight .. i live in Australia also in the New England region, in a town called Glen Innes NSW. Just completed this quick and simple scarf for my daughter! I made this in Homespun Tudor…has a real Spring look. My daughters and I are short so I fashioned a large knot at both ends. Looks great and I know she’ll love it. Amy, thanks again for sharing your pattern. Hi Kitty! I’m glad you like the pattern. What a great idea! Thanks for sharing. It looks beautuful and I’d love to make this but I am a beginner and am not sure I understand the directions. In most things I’ve done, at the end of a row there is a “turning chain” or chains. Here there doesn’t seem to be but instead the beginnng of the next row will start with chain stitches. Do I turn the work after each row and then chain? Or for this patterm does it even matter whether the chain is done first and then the work is turned? I realize this is a real neophyte’s question but thank you for answering! This pattern is made in a continual round, like a spiral staircase. It just continues in the same way for a few rounds and you can keep track of the rounds by marking them. (I like Susan Bates’ markers). I hope this has been helpful. If you still have some questions, don’t hesitate to ask. Thanks Amy! Very helpful. In fact, I’ve already made the scarf! I used a Homespun-type yarn (different brand) in light blue, yellow, and light purple. It will be a gift and I think it will be wonderful for spring in our climate. Some things I learned that may help folks who are as new to crochet as I am: As you suggested, I did use stitch markers. I found them especially helpful to keep track of the number of ch sts I made in the foundation chain. (I put one every 30th st and a different color one at the 150th st) One thing I had trouble with (not the fault of the pattern or instructions but my inexperience) was counting stitches to place the sc in Row 1. I wouldn’t have had trouble had I been using a smooth thick solid-color yarn but it was sometimes hard for me to see individual sts with a Homespun-type varigated yarn. When I make this again (and I will!) I plan to graph out where the sc will go and place st markers there instead as I make the foundation chain. That way, I can use those markers to keep track of the st count as I make the foundation ch, but I also can leave all of them in while I do Row 1. I am sure more experienced folks won’t need to do this but it may help newbies. I’m glad you like the pattern! I remember when I first started using Homespun. It was really hard for me to find the stitches and I got really exasperated, but the more I have used it the more familiar I have become with the yarn. You learn to be able to feel the stitches, literally, and this helps immensely.